Community pages are a necessity for any Realtor’s website. They provide a valuable resource for your website visitors. The community pages prove that you are the authority in the communities you serve. Just as important as the information that you provide is the opportunity to strengthen your personal brand. Your community pages will be personalized by you and about what you know, so your audience will get to know you through your perspective. A community page is an individual page on your website that is simply a summary of a community that you serve (we’ll outline some examples of the type of information to include in your community page). A Realtor’s website should have a community page for each of the primary communities that they work in. Also, to state the obvious, Realtors should not create a community page for an area that they don’t serve, or isn’t one of their primary communities. Many Realtors include short summaries of every community on one page, which is often their home page. Don’t do that. Rather, each community should have its own page. Having individual pages for each community is more clear for the website visitor, and Google will rank your website and each page higher. Information about the communities that you serve is already on Chamber of Commerce website and Wikipedia for that city or town. So why do you need to write about the communities when people can get all the information somewhere else? Because those websites are too generic, boring, and don’t give the personal touch that you can. You have an advantage over the Chamber of Commerce and Wikipedia. Since you serve those communities, you are a legitimate community expert who has experiences and knows the finer points about the communities. Your brand will tell the story. The primary reason of having a website is to provide value to your website visitors. You want to eventually turn your website visitors into leads, but just having a website isn’t enough for visitors to voluntarily hand over their contact information. You need to give them a reason. Different parts of your website provide different types of value. You have IDX so that your website visitors can search for homes. You have a blog discussing topics that are helpful to your ideal type of client. And you may even have a resource page of the best lenders, inspectors, handyman, and electrician. Community pages provide another specific form of value to your visitors. People who are interested in moving to a community want to learn more about it. People who live in the community always want to learn something new and use it as their go-to resource. I’m sure you know many other reasons people would get value from community pages, just by the questions you have been asked about communities in the past. Realtors think that everybody wants work with the best. And in reality, that’s probably true. Unfortunately, Realtors aren’t always effectively proving that they are the best. Just about every Realtors’ website or profile page states something like that they are “the best”, “the #1 something or other”, “the top selling”, or they will “work harder for their clients”. But just saying that doesn’t make it true. And just saying it doesn’t make the reader believe it. A good community page with detailed information will show your website visitors that you are the top authority of that community. It will show that you know the area so well that they know that they can ask you anything, and you will provide a competent answer. It will show that if they want to work with the best, they will have to work with you. A community page doesn’t just say that you are the best, your community page proves it. Every Realtor that has a website lists the communities that they serve. Unfortunately, that list is usually about 20 communities long. I have never met a Realtor who can provide the same high level of knowledge for that many communities. Imagine you are a home buyer, and you want to buy a house in Anytown but you don’t have a Realtor. You land on a Realtor’s website, and it shows that they serve Anytown…and 19 other towns. How much confidence do you have that they could know Anytown well enough to provide you great service? Now imagine you land on a Realtor’s Anytown community page on their website. That community page explains so much about the town in detail that you feel like you’re at a coffee shop with the Realtor talking about Anytown. They probably serve other towns, but they prove that they are an expert on Anytown. How much confidence do you have that this Realtor knows the real estate market in Anytown? Those are obviously rhetorical questions. You can tell visitors the communities that you serve by listing all 20 of them, or you can prove that you are the expert in a handful of communities through your community pages. 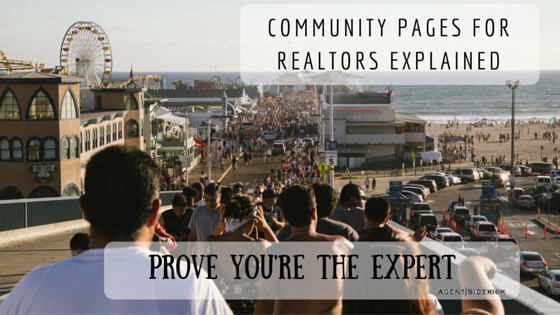 How many Realtors in the areas that you serve have community pages on their websites? Out of those, how many are actually any good? In reality, very few Realtors have good community pages. That means that if you put the effort into your community pages, it will be easy for you to become the authority for those communities that you serve. Sad but true that a lot of the value that you would get from community pages is from the fact that other Realtors just don’t have them. Use other Realtors’ laziness to your advantage. Google wants to promote websites that people get value from. Google loves local authorities. Google doesn’t have many local authorities to choose from in the areas you serve. Your community pages will improve your search engine optimization (SEO), helping your website rank higher in the search engine ranking page (SERP). Not only will each community page rank higher, but your entire website will rank higher as well. For example, if someone is searching for information specific to Anytown, most Realtors’ websites that just say “I serve Anytown, Banytown, Canytown, Danytown, Fanytown, and 15 other towns” won’t appear on the SERP. But your Anytown page on your website will rank highly on the SERP. Another example, is that if someone is searching for a Realtor in Anytown, most Reatlors’ websites won’t be able to rank high on the SERP. Since Google knows that you are a Realtor who is the local authority in Anytown, your entire website will rank higher. Google will love your website. And so will other search engines like Bing, Yahoo, and others. The goal of a community page is for your visitor to learn about the community. Some topics that you could include include are listed below. Plan to have a separate section for each topic. In addition to these topics, what types of questions do your clients tend to ask? Make sure to somehow answer those questions for each community. Location in relation to major cities, mountains, ocean, lakes, landmarks, etc. Commute times and transportation methods to closest city, airport, nightlife, etc. Annual events, festivals, parades, etc. Restaurants, bars, entertainment, parks, etc. Feel free to personalize your community pages. Anyone can go to the town’s Chamber of Commerce website or Wikipedia for information. But you have the opportunity to tell real stories and put context to everything you talk about. Personalizing will give your explanations character and prove to your website visitors that you really do have an intimate knowledge of the areas. A community page is critical for every Realtor’s website. Your website needs to give your visitors the value that they would get as if you were talking to them. The way you talk to people is your brand, and your perspective of the communities you serve strengthens your brand. You spend time and money to get a website, so it is important to make sure it gives back to you in the form of leads. If you are interested in getting a website to show your knowledge of the communities you serve, Agent Sidekick can help. Please contact us to let us know your needs.